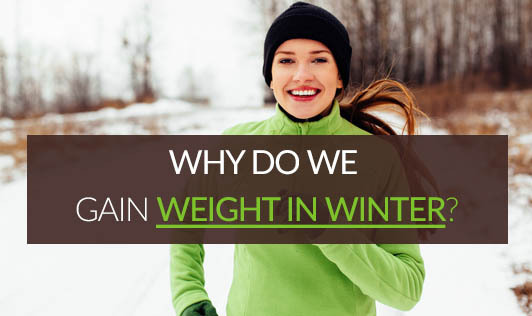 Along with chapped lips and dry skin, has weight gain become another issue that winter brings to you? Gaining weight is a natural phenomenon in winter. Wonder why? Vitamin D is absolutely critical for calcium metabolism. Vitamin D deficiency symptoms include weight gain, fatigue, and a low mood, but few people are aware they have it. A lack of sunlight can lead to a deficiency in this vitamin, which may cause weight gain and bone deformities. Low absorption of calcium and minerals, especially during winter, also brings down our satiety levels and this is the reason why you crave for pakodas or eat more in winter, leading to weight gain. But, do not worry, your body is preparing to welcome winter. When your body is in distress or not comfortable with the temperature outside, it naturally starts storing fat to defend from the cold weather. This protection is given by the adipose tissue i.e. fat cells beneath the skin, to give us warmth. This phenomenon is called SEASONAL AFFECTIVE DISORDER (SAD). Longer nights mean more sleep and more sleep means feeling sluggish throughout the day. The more you sleep, the greater it will impact your body cycle, which could make you lethargic. This also impacts your work out regime, leading to weight gain. The holiday season brings with it an influx of parties and gatherings that are fueled by plenty of drinking and eating foods that are usually high in calories. It sounds fun at the get-go—but this adds to weight gain. Keep yourself warm with chikkis, gajak, sesame-jaggery laddo, etc. as they are highly nutritious. Sesame is rich in calcium too. Moreover, it helps you in cutting down on too many coffees and teas. Include lots of greens like fenugreek, spinach and a variety of vegetables like carrots, radish, and peas in your diet. Keep potatoes aside and eat seasonal, locally available veggies to boost your immune system. Sunbathing is the best way to keep your weight under control during winter. So, try to get your dose of sunlight whenever you find the time. Spice up your food with garlic, ginger, and onions as they help in fat burning. Drink plenty of water to keep yourself hydrated and indulge in mindful eating as your satiety is low during winter. Above all exercise, as it can keep you warm and burn fat. Give your bones enough sunlight and keep your winter blues at bay!